Delray Beach Health Insurance Consultants have been providing sensible and helpful insurance advice and coverage to individuals, groups and families throughout Florida for over 25 years. Our agency is based in Delray Beach, Florida but we have clients throughout Florida and will visit your home or business from Fort Lauderdale to West Palm Beach, including Boca Raton, Deerfield Beach and Boynton Beach. From PPOS and HMOS to long term care insurance, short term care and international insurance we offer all types of coverage and are always happy to provide you with a FREE quote on your health insurance needs. Our agents stay current with ever evolving health care system and policy changes and are here to help you understand and make sense of the many choices available in the ever evolving health insurance space. They will teach you the right questions to ask and answer the questions you have Their goal is to help inform and explain the features of the various plans to her clients in an easy to understand way. At Delray Beach Health Insurance, our goal is to provide the Delray Beach Health Insurance for our clients at the best rates and to also help them understand the benefits and limits of the policies they select. Let them help you decide which insurance plan is Best for you. 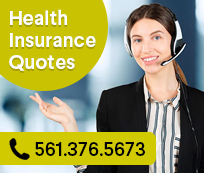 Delray Beach Health Insurance was the number one health insurance agent in Palm Beach County, Florida during the year 1995, according to CAC-United Health Care. They have been honored by the Community Health Purchasing Alliance (CHPA) as a Silver Level Agent.